Raj Tent Manufacturing Company is one of the top tents or temporary shelter manufacturing and Supplier Company in many different country. Tents or temporary shelter is very important for the sitting arrangement of the guest and host for the outdoor party or function celebration. Your party celebration is depend on the quality and design of the shelter. 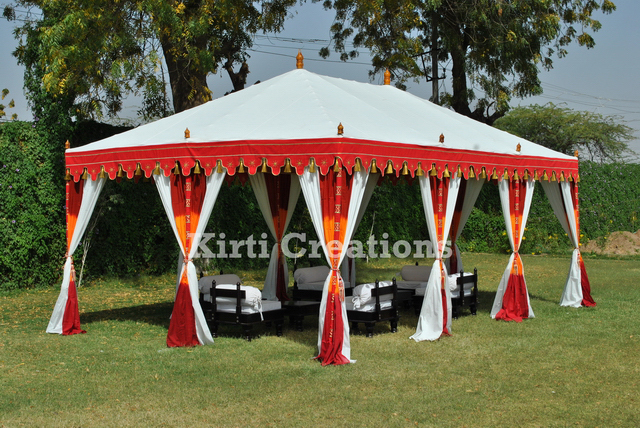 Majestic Garden Tents: - Majestic Garden Tents is mainly used for the small and medium size of party celebration or better sitting arrangement of the visitor guest. This tent is made from the quality based canvas with two different color, the top part is decorated with the milky white color that is pure water proof and the middle and lower part contain orange color which reflect nice look. All side of this Handmade Tent is open by which you are comfortable with the natural environment. Pure waterproof canvas is used in this tent. Comfortable and luxurious from inside. Raj Tent design Majestic Garden Tents keeping in the view of the nice look and comfortability for the people who come to join the meeting, party and function. Raj Tent Suppliers is first people choice for all type of the tent and shelter hiring or purchasing to sitting arrangement and better decoration of the party venues. 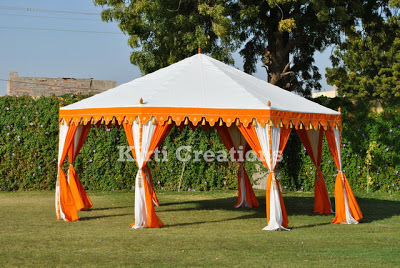 Tent is one of the most important ingredient for organized the party of function or other type of the meeting. There are variety of the temporary shelter are available for the different type of party function and meeting according to requirement of the host or organizer. Wedding Garden Tents: - Wedding Garden Tents is one of the most demandable variety of the tent which is mainly used for the wedding party celebration. Our expert team design this tent with white and red combination of the color which give the bridal look to this Handmade Tents, this tent are used for small, medium and large party. This tent is made from pure waterproof canvas. Nice color combination reflect the beautiful look. Strong stability in all type of add weather. Raj Tent are one of the best people choice for providing different type of the temporary shelter in many developed and developing country. The expert team member of the Raj Tent Retailers made nice Raj Tent Canopy for each and every type of the tent, which is main eye attraction of the visitor.